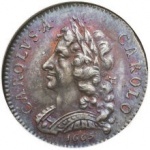 Like so many objects, coins were used as part of the political scene in the 17th century. Charles I used the legend on the pound coin to emphasise his conviction that he was chosen by God to rule: it read CAROLUS D G MAG BRIT FRA ET HIBER REX (Charles by the grace of God, King of Britain, France and Ireland). On the Crown coin he had CHRISTO AUSPICE REGNO (I reign under Christ's auspices). The pattern was followed by the Parliamentarians. After they had disposed of the monarchy, they emphasised their Puritan principles by using English language mottoes on coins, usually THE COMMONWEALTH OF ENGLAND on one side and GOD WITH US on the other. The period is regarded as one of the most interesting in British history for numismatists, not least because it saw the end of hand-striking of coins. In order to understand the coinage that would have been used in the mid-17th century, it is necessary to appreciate some of the history that gave rise to the framework of Britain’s currency as well as a few basic facts about the history of the country’s system of weights. Arguably the most important difference between coins of the 17th century and those in use today is that of value. In the 17th century the metal content of a coin was generally worth the same as the coin’s face value. So a silver penny melted down provided one pennyworth of silver. By contrast, modern coins could be regarded as mere tokens. Melt down a pound coin today and it is highly unlikely that the resulting blob of metal will be worth £1.00. This question of value is at the heart of the structure of the currency. There had been coins in use in Britain since the first century BC. Later, when the Romans invaded they brought their coinage with them and this was used throughout the occupation. During the Dark Ages coinage was less prevalent but as commerce began to revive, coins were issued by various Bishops, Abbots and nobles as well as kings. One of these, Offa, King of Mercia, is thought to have introduced the penny in the middle of the 8th century. The penny was the base unit of the British currency for almost five hundred years and sometime around the 9th century AD, the weight of a silver penny was set at 24 grains. Given that there were 480 grains in a Troy ounce, this resulted in there being 20 pennies to the ounce. At that time the pound weight still followed the Roman pattern so there were only 12 ounces to the pound and this was known as the Troy pound hence moneyers could strike 240 pennies from a pound of silver. The quality of the silver used was known as Sterling and comprised 92.5% by weight of pure silver. It was mixed with another metal in order to make it hard wearing enough to be used for coinage. By the time Charles I ascended the throne, there were machines for striking coins but hand-hammering was faster and more accurate: the weights of the machine-made items often had to be adjusted by hand. The most important figure in relation to coinage during the reign of Charles I was the Frenchman, Nicolas Briot. He tried to introduce coining presses in France but failed and fled to England where he was employed by the King. He became chief engraver to the Royal Mint in 1633 and at the outbreak of the Civil War, he took the coining apparatus from the Tower and set up the mints in York and then Oxford. Until the outbreak of the War the most important source of coins was the Tower Mint in London. During the Civil Wars other mints were set up all over the country including one in Aberystwyth in 1637 to strike coins from Welsh silver. Even though Parliament was at war with the King, coins with Charles’ name and portrait continued to be struck at the Tower mint until 1649. Two of the most notable mints set up by the Royalists during the war years were at Shrewsbury and Oxford. In addition to the official mints, siege coinage was produced in Carlisle, Newark, Pontefract and Scarborough. This was done by persuading local people to provide silver items that could be used to produce rudimentary coins, in many cases, of an odd denomination. There are examples of a coin with a value of five shillings and eightpence being minted in Scarborough along with others worth two shillings and tenpence, two shillings and sevenpence, one shilling and ninepence and so on. For their part, although Parliament controlled the Tower mint in London they, too, set up mints around the country where they produced coins that were little different to those issued prior to 1642. It wasn’t until after the execution of Charles I that Parliament changed this: mottoes were converted to English, the Commonwealth arms were included and, in 1657 production started on Cromwell coins. In addition there was the Mark and although it had a notional value of 13 shillings and fourpence it was used only as a unit for accountancy purposes: it was never issued in Britain as a coin. Farthing: was worth one quarter of a penny which was one of the longest-lasting but most sporadically issued of British coins. It was first minted in the 8th century although it didn’t become widely used until 959. But in modern terms a penny was worth in excess of £2.00 so it would have been necessary to give change. There were no smaller coins so pennies were cut into halves or quarters. Some sources claim that this was known as halfing or fourthing and that this latter word evolved into the word Farthing. There is a certain logic in this, given that a farthing was worth one quarter of a penny. However, other sources claim that the word comes from the Old English feorthing, which, itself, has its roots in feortha meaning a quarter. Whatever the true origin of the name, the problem of giving change was solved by the issue of the Farthing in 1279 and from that point on it had a chequered history due, in part, to the fact that it cost more to make than it was worth. Monarchs didn’t like subsidising the currency so there were protracted periods when no farthings were produced. 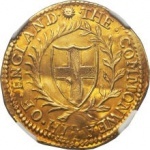 Various farthings were issued during the Commonwealth but it seems that they were not regarded as currency until the farthing coin struck in 1672. The Farthing remained in use until it was withdrawn on 31 December 1960. Halfpenny: (pronounced haepenny) When the penny was originally produced, change was achieved by cutting the penny into halves or quarters, usually along the lines of the cross that was prominent on one side of the penny. This was known as ‘cut coinage’. The Halfpenny was introduced during the 13th century and they continued to be issued throughout the following years. Very few halfpennies were minted during the reign of Charles I and none at all seem to have been produced during the war years. The last silver halfpennies were minted during the Commonwealth. Penny: By the mid-seventeenth century a silver penny weighed 7 23/31 grains or 0.50 grams of silver and but there were still 240 of them to a pound. Pennies were originally struck from the best available silver but in the reign of Henry II the standard of Sterling Silver was introduced. This is made up of 92.5% silver. Twopence: (pronounced tuppence) a coin also known as a Halfgroat was introduced in 1351. They were issued under Charles I, the Commonwealth and Charles II, usually in silver but there are copper examples around. Threepence: (pronounced threppence) originally introduced in the reign of Edward VI and remained in use until James I when it fell out of favour. It was reintroduced as a silver coin under Charles I and it remained in production from 1638 to 1649. Groat: introduced in 13th century and worth four pennies. They were produced from 1642 to 1649 and continued in use during later years only being withdrawn in 1856. Sixpence: introduced in 1551 and continued in use until 1980 - nine years after decimalisation. Shilling: also known in modern parlance as a bob. (As in ‘It cost a couple of bob’.) The coin was originally known as a testoon and was probably introduced around the end of the 15th century. It became known as a shilling during the reign of Edward IV and was minted under Charles I and the Commonwealth. There are 76 different Charles I versions listed in The Coincraft catalogue. Half crown: worth two shillings and sixpence. The coin was first issued in 1549 and discontinued in 1967. It was demonetised in 1970 ahead of decimalisation. During the 17th century, half crowns were made of silver and were issued under Charles I as well as during the Interregnum and Cromwell’s period as Lord Protector when they carried his portrait. Crown: introduced by Henry VIII in 1526 with a value of 5 shillings. 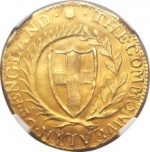 It was issued as a gold coin under Charles I, the Commonwealth and Cromwell. Angel: The angel was first issued in 1461 with a value of half a mark or 80 pennies. Its value was increased to 7 shillings and sixpence in 1526 and by 1612 it was worth eleven shillings. In 1619 a lighter angel was introduced with a value of ten shillings. The last angel was minted in 1643. Pound: The pound (or, to use its official title, the pound sterling) has its origins during the reign of Offa, King of Mercia. He introduced the silver penny and 240 of them could be struck from one pound (1lb) of silver, hence the term pound sterling. In 1663 gold coins were introduced based on the 22 carat guinea. This originally had a value of one pound sterling but it increased in value as the price of gold rose. In 1717 its value was fixed at 21 shillings. The pound sterling was adopted as currency of the Royal Chartered Bank of England in 1694. Broad: was worth 20 shillings and was introduced in 1656 as part of the set of coins issued under Oliver Cromwell. Guinea: was introduced as a gold coin on 6 February 1663. It was originally worth one pound sterling (20 shillings). As the price of gold rose, the weight of the guinea was reduced but even so, by the 1680s it was worth 22 shillings. The last issue was in 1813 when 80,000 guineas were struck to pay the Duke of Wellington’s army in the Pyrenees. The coin continued in use until the Great Recoinage of 1816 but even after that date it was used to define the price of thoroughbred horses and fine art, a practice that continued after decimalisation. Half unite: the unite was a 20 shilling coin and the half unite was minted from 1642 to 1644. Unite: gained its name because of the legend on the reverse FACIAM EOS IN GENTAM UNAM (I will make them one nation). They were introduced by James I, were issued by the Commonwealth and the last examples were minted under Charles II. Siege coins: were produced in a number of places including Carlisle (1644 to 1645), Newark (1645 and 1646), Pontefract and Scarborough. The coins were often crude and ill-shaped and were struck from plate provided by local people and, very often, the town itself. This page was last modified on 31 August 2014, at 17:39.